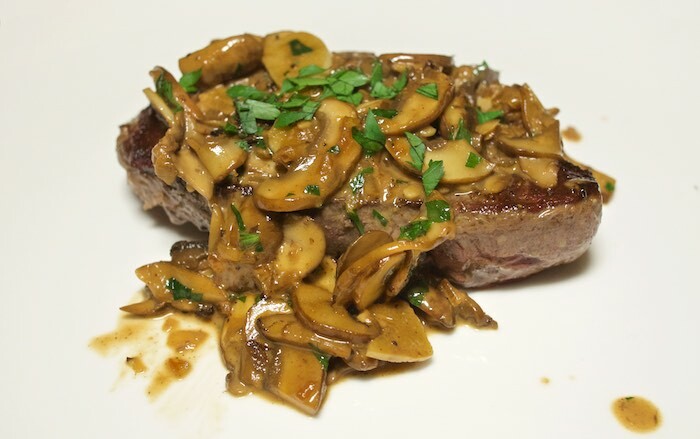 We don't eat a lot of steak but when we do I like to serve it with mushrooms. I'm sure most people will agree that the rich taste of the meat pairs perfectly with the earthy flavor from the mushrooms. Keeping this in mind, when my husband mentioned grilling some top sirloin steaks for dinner I set out on a mission to find a mushroom recipe to accompany them. What I found was this amazing Creamy Whisky Mushroom Sauce on the Steamy Kitchen website. Everything about this recipe sounded delicious and it most certainly didn't disappoint. The recipe says it makes enough to top 4 steaks but hubby and I ate it all! Seriously, it was that good! 1. Season the steaks with salt and pepper on both sides. 2. Heat a large cast iron pan, with olive oil, over high heat. When very hot, add the steaks. Cook both sides until desired doneness - timing depends on thickness of steak. We enjoy our steaks medium rare. Remove meat to a plate and tent with tin foil while you make the sauce. 3. Return the same pan to the stove, and melt the butter over medium heat. When the butter starts bubbling, add the onions and saute until the onions are soft, translucent and just slightly golden. Take care not to burn the onions by keeping your heat on medium and stirring constantly. This will take about 3 minutes. Add the garlic and saute for an additional minute until the garlic is fragrant. 4. Turn your heat to medium-high and add the mushrooms all at once. Immediately start tossing so that the onion/garlic/butter mixture is evenly distributed. Saute the mushrooms until they are browned and softened, about 3-5 minutes depending on the thickness and size of your mushrooms. 5. Season with salt, pepper and nutmeg. Add the whiskey and the balsamic vinegar and let the mixture bubble a bit to burn off some of the alcohol. Turn the heat down just a bit and add in the heavy cream. Let it bubble for another 30 seconds and then taste to adjust the salt. Stir in the freshly minced parsley and spoon over your grilled steak.